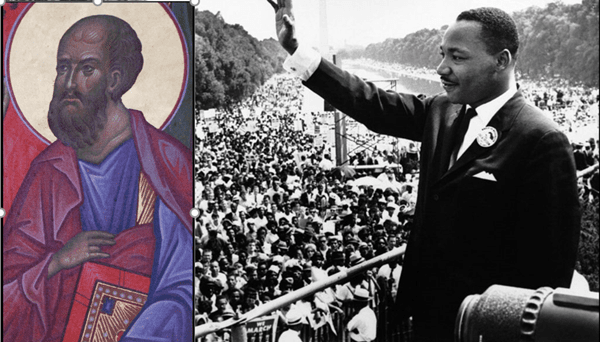 Paul’s Second Letter to American Christians As We Remember Dr. Martin Luther King, Jr.
Paul, called by God to be an apostle of Jesus Christ, to the church in the United States, grace and peace to you from God our Father and our Lord Jesus Christ. The injustices that killed your prophet Martin Luther King, Jr. remain largely undealt with to this day, America. Even as you have marked a day to celebrate his life, the forces that took his life – the structures of inequality and prejudice that he struggled to transform – remain standing, indeed fortified by the deception that their transformation has been completed. The militarism and greed against which he railed have only increased, masked beneath the mind-warping propaganda of national security and an American dream turned nightmare. His dream of equity is given lip service while the forces of dehumanization in their manifestations of racism, militarism and materialism continue to poison human hearts and wreak destruction on the planet. It is futile to honor as a holy day the anniversary of his birth when you will not heed the mission to which he committed his life. This is not to say that I have not seen the moral progress you have made, America. Laws enforcing segregation have been overturned, voting rights have been expanded, and interracial friendships are common. All of this is good. And yet, I fear too many among you have let past progress obscure your recognition of the need for continued progress in the present. Indeed, many of you celebrate the attainment of your noble ideal – liberty and justice for all – prematurely, failing to notice the ways in which your nation denies both to many, particularly your darker-skinned citizens. In fact, many of the hard-fought gains in civil rights have already been eroded by the forces of hate and the even more insidious forces of apathy. America, you must be vigilant in upholding justice! If you deny liberty and justice to some, you deny it to all, for no one can be free until all are free. Furthermore, while you celebrate a false freedom and justice in your own land, your nation imprisons other lands in the terror of endless war. I pray you recognize where the moral progress you have made is slipping away and repent, for the prisons are filling, the gap between your rich and your poor is widening, and violence is spreading. The changing of laws is but the beginning, not the end, of righting centuries of injustice. The violence and dehumanization that built your nation on a foundation of sacrifice has never been transformed. Though your laws have changed, you have failed to confront the poverty and exclusion that they have left behind. As the violence you long inflicted on your darker citizens continues, you have elevated your violence against other lands and peoples of the world. At the heart of this evil, America, is your failure to look upon the harm you have caused and repent. You only wish to see your good and you have blinded yourself to the wicked within you. The desire to view one’s self favorably at the expense of someone else – to elevate the self above others – has never been properly recognized or repented, and thus racial segregation and dehumanization have changed form but not been transformed, and poverty, prejudice, and violence remain. America, do not sink further into blindness by mis-honoring Dr. Martin Luther King, Jr., claiming his work is done when it is your job to make sure it continues! His work was work that God has imprinted upon all of your hearts, because you are image-bearers of the Living God. Do not be fooled into thinking that it is over when the task of spreading peace and justice – the task of transforming a world built on sacrifice and injustice into a Beloved Community built on mercy and compassion – is ongoing and continuous. If you would honor King’s dream, America, you must not be content merely to extinguish the language of segregation from your laws, but must also banish from your hearts the deceit that compels you to build yourself up against your brothers and sisters. You must not seek your identity against your brothers and sisters, but find yourself bound with them in the body of Christ. For when you recognize that your destinies are intertwined, you will open your eyes to the barriers that continue to divide you. When you know that your well-being is bound to your neighbor’s, you will open your eyes to the inequities in housing, education, medical care and criminal justice that persist and work to transform them. And when you can see the violence that your nation inflicts upon her own citizens, you will be able to see more clearly the violence that is wrought in your name around the world. When you can see the structures of greed and prejudice and violence that harm your brothers and sisters in your own land, when you can see the scaffolding of injustice that permeates your nation through the myth of exceptionalism that you paint over the pain you do not wish to see, you will also see, through the myth of “humanitarian warfare,” other lands and other peoples torn apart by your weapons. When you see that the structures that shape your nation serve powers of money and materialism instead of people, you will also see that your nation is shaping the rest of the world according to the interests of these powers. When you recognize the dehumanization at the heart of it all, cease your violence and work for reparation and reconciliation, you will then reclaim your own humanity. Your humanity is grounded in nothing less than the outpouring of God’s Love, fully revealed in Christ and carried to the ends of the earth in the 7 billion image-bearers that are God’s children. Martin Luther King, Jr.’s deep understanding that there is no peace without justice and no justice without peace – his wisdom that peace and justice are bound inseparably in the Spirit of God that sweeps through the earth, must become your understanding, America. I pray it may be so. And now to the God who has created us in God’s own image of Love, who knows how far short we fall from this image and yet upholds us in mercy so that we may look upon the worst within ourselves without fear and be transformed by grace into the vessels of Love we were meant to be, to the God who holds Martin Luther King Jr. and all the saints in the eternal embrace of perfect Love, which is the full realization of justice, to the God who has charged us to do Love’s will on earth as in heaven, that by grace we may be instruments of peace, to God be all honor and glory and praise, now and forever. Amen. 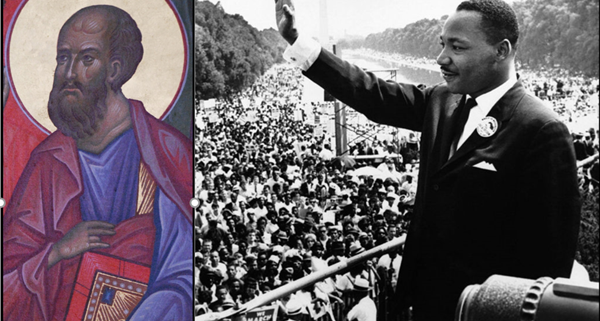 Images: Left: Saint Paul the Apostle, St. Paul the Apostle Orthodox Church, Dayton, Ohio. Available on Wikimedia via Creative Commons Attribution-Share Alike 2.0 Generic license. Right: Martin Luther King Jr. addresses a crowd from the steps of the Lincoln Memorial where he delivered his famous, “I Have a Dream,” speech during the Aug. 28, 1963, march on Washington, D.C. Available on Wikimedia. Public Domain. Images modified.